The Quickster – From SpongePedia, the biggest SpongeBob-wiki in the world! Powers: The uncanny ability to be really "quick!" 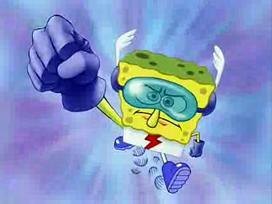 The Quickster is a superhero who is only seen in the episode Mermaid Man and Barnacle Boy V. He is part of The International Justice League of Super Acquaintances. He is briefly SpongeBob. He (known from his name) has the ability to run extremely fast, such as running to a mountain so fast you can't see him do it. His costume is white with a red lightning bolt on it. Speed; can run extremely fast without being seen. Red Jellyfishes (Only in Nick Arcade Game Atlantis Squarepantis: Square Off). He was originally named "The Whizzer". The Quickster is a parody of the superhero, Flash. The Quickster is the only superhero out of four not to be based on a Fantastic Four character. He replaces what would be a parody of the Thing. He looks a lot like Captain America.